This chapter is part of POMEPS Studies 33: The Politics of Rentier States in the Gulf. Download the full PDF here. The mounting number of mechanisms linking oil wealth to political outcomes risks obscuring how the practice of politics affects the distribution of these rents. Explaining who gets what, why and how under authoritarian regimes, and how these choices change, is of particular interest in the Middle East and North Africa, where states control significant non-tax revenues (see Figure 1) and where changes in the distribution of state revenues can have a considerable impact on citizens’ welfare. In this memo – through a case study of labor market reforms in Saudi Arabia – I suggest that instances of “rentier distribution” provides us with a window into broader questions of how resources are distributed under authoritarianism. 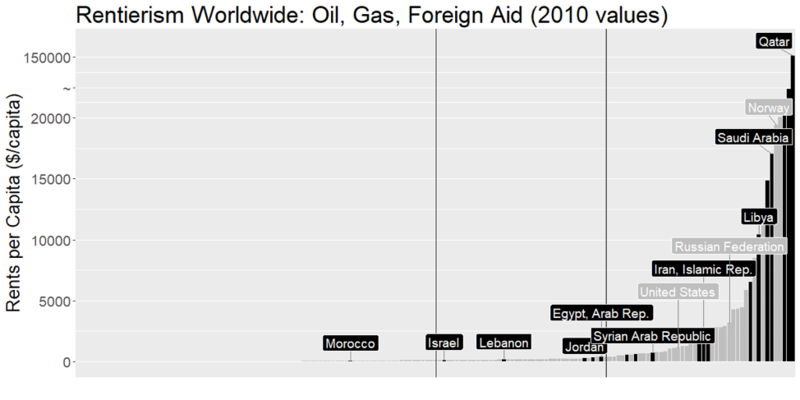 Figure 1: Countries of the world arranged in order of aid and gas/oil rents per capita (2010 values, Ross and Mahdavy 2014). Select countries labeled, MENA countries marked in black. Theories in the rentier and “resource curse” literatures (Ross 2015: 243-248) are most commonly associated with the (usually negative) effects of oil on democracy. These approaches have typically fared better at predicting cross-national variation than change over time. Assumptions that the political fortunes of rulers closely track energy markets tend to over-predict the collapse of resource-rich regimes (Lowi 2009; Gause 2015), while statistical tests have struggled to find a consistent effect of resource wealth on degrees of democracy (Haber and Menaldo 2011; Liou and Musgrave 2013). At the same time, explaining the political trajectories of oil-rich countries through durable institutions or founding “pacts” (Smith 2007) in turn overlooks the potential for substantial political change as regimes age (Slater 2010). Inequalities of distribution – even in the most generous of rentier states – can empower new social classes or generate new challenges to regime stability over the years (i.e. Chaudhry 1997; Okruhlik 1999; Gengler 2015). Existing understandings of authoritarianism struggle to account for change in political “choices” about rent distribution. Perhaps rulers stand by durable coalitions of support formed at critical junctures in regime trajectories (Waldner and Smith 2015); or they cater to whichever constituencies are best organized to lobby for their preferred policies (Karl 1997: 16-17); or they spend more in general on social services when resource booms permit (Morrison 2009) or simply whenever they feel threatened. Yet we know that top-down changes in authoritarian distribution can occur even in the most authoritarian of countries (Shirk 1993; Wallace 2014), changes that are difficult to account for when we assume that regimes are captive to social constituencies or the movements of international markets. Even with rentier wealth, rulers have to make choices. My research suggests that rulers will seek to alter their political coalitions – the collection of social groups the regime takes to be its supporters – when they worry that they are retaining ineffectual allies at the cost of cultivating active sources of support. As Jessie Moritz notes in highlighting the limits to co-optation via rent distribution, there is plenty of cause for autocrats to worry when strategies of social control fall flat. Rulers can seek to remake coalitions through policies that distribute wealth or make costly symbolic concessions to new constituencies (Musgrave and Liou 2016), either to gain leverage against elite rivals (Waldner 1999) or to ward off political challenges observed in key reference countries (Koesel and Bunce 2013). Others in this volume outline the ways in which states have deployed rentier wealth to court such support, via policies that go beyond simply cutting a check for society at large. State-funded programs to support women’s entrepreneurship, Crystal Ennis notes, court international approval and buy-in from some women – to varying degrees of success. Calvert Jones likewise notes the efforts of Gulf rulers to convert resource wealth into symbolic capital, such as social reforms by Saudi Crown Prince Muhammad bin Salman that aim at building popular support while undermining the authority of conservative religious clerics. Justin Gengler and others in turn demonstrate that some policies’ symbolic (and hence political) importance to citizens outweighs their raw material value. In terms of labor policy, the monarchies of the Gulf Cooperation Council (GCC) have long conceded efforts to nationalize private-sector workforces in the face of lobbying efforts by employers eager to prevent policy changes that would raise the cost of expatriate labor and cut into their profits. The resulting open migration policies, which cede considerable discretion to individual employers, have resulted in expats forming anywhere from 55% to 95% of these countries’ labor forces (GLMMP 2017). Forceful action on nationalization might signal regimes’ concern with citizen unemployment and underemployment, yet would risk upsetting the seemingly sustainable status quo of shunting citizens into growing public-sector payrolls. In Saudi Arabia, however, the Ministry of Labor has aggressively pursued “Saudization” in recent years – even before oil prices fell sharply in 2014 (cf. Shin 2017). Reforms came despite the fact that direct government subsidies appeared to have immunized the country’s Sunni population from the Arab Spring uprisings without angering Saudi employers. Representative political institutions such as the Shura Council remained little more than window dressing, affording citizens little means to counteract private-sector lobbying as is the case in Kuwait (Herb 2014). What happened? Prior to 2011, workforce nationalization efforts dating back to the 1970s had come and gone to little effect in Saudi Arabia (Randeree 2012: 13). Hand-wringing about unemployment and “labor market imbalances” made a regular appearance in Saudi media during the 1990s and early 2000s, yet strategies for curbing the employment of foreign workers in favor of citizens frequently ran up against Saudi business lobbying. So “inexpensive” was imported labor that the expatriate population grew regardless of how the Saudi economy fared – employers could always find a way to turn a profit (Hertog 2012). Even as the Economic Development Board under Crown Prince Salman in neighboring Bahrain aggressively pursued coordinated action on labor-market and other economic reforms in the early 2000s, the Saudi Ministry of Labor struggled to maintain a coherent policy line on Saudization. New regulations in Saudi Arabia were typically imposed by fiat, unevenly enforced, and suffered a slow death by a thousand cuts as private-sector interests leveraged personal ties to secure continued access to visas. As Steffen Hertog notes (2010: 191-203), technocrat Ghazi al-Gosaibi and other allies within the Ministry of Labor received royal backing from then-Crown Prince Abdullah to slow the number of new permits issued by 2005, only for the ongoing oil boom to strengthen the hand of the diffuse business community (Hertog 2010: 212-213). With representatives of the Council of Chambers and Industry lobbying (now King) Abdullah about the importance of migrant labor in fulfilling mounting state contracts quickly and cheaply, the King directed Gosaibi to quietly retreat from Saudization targets in sectors related to state development goals: education, healthcare, industry, and construction (Embassy Riyadh 2006). Figure 2: Composition of Saudi private sector by citizenship, 2004-2014. Source: Saudi Arabian Monetary Authority annual reports (2004-2014). As reflected in Figure 2, Saudization of the private-sector workforce slowed accordingly. Saudization remained a stated priority but would not be pursued at the expense of aggregate economic growth (Embassy Riyadh 2009). Expatriate labor remained a more economical choice for private-sector employers, leading to a surprising number of layoffs of Saudi citizens in the wake of the global financial crisis and crashing oil prices over the course of 2008 to 2009. The Ministry of Labor recorded a nearly 18% decrease in the number of Saudi citizens employed in the private sector across this time period, prompting Gosaibi to issue stern warnings of the Ministry’s willingness to “protect the interests of the national workforce” by sanctioning any employers using the financial crisis as a pretext to lay off Saudi citizens (“’al-‘aml’” 2009). While recruitment of foreign workers continued, barely 10 percent of private-sector employees were Saudi citizens on the eve of the uprisings that rocked the Arab world beginning in late 2010. The uprisings of the Arab Spring changed perceptions among Saudi leadership that workforce nationalization could be put off indefinitely, prompting efforts to demonstrate a credible policy commitment to employing citizens. In contrast to the mass unrest of the 1994-1999 Intifada that helped precipitate economic reforms in Bahrain, the 1990s and 2000s in Saudi Arabia saw few protests marked by socioeconomic grievances outside of Shia areas in the country’s Eastern Province (Menoret 2016). Despite a small uptick in unemployment, driven largely by more Saudi women seeking to enter the workforce, the rate of Saudi job-seekers unable to find employment was still below what it had been just a few years earlier (see Figure 3). Figure 3: Saudi unemployment rate by gender, 1999-2014. Source: Saudi Arabia Monetary Authority (SAMA). In 2011, however, authorities feared that the region-wide unrest of the Arab Uprisings might ignite latent grievances within the Kingdom as well. While online calls for demonstrations in Saudi Arabia never coalesced into a nation-wide movement, fears within the government were not easily dispelled. Official demands for quiescence were unequivocal: “The necessity of obedience in the land of Islam and the heartland of belief is not up for discussion,” underscored a Friday sermon following the GCC intervention in Bahrain (al-Tayyar 2011). While a “Day of Rage” in Riyadh planned for March 11 attracted only a single protestor, King Abdullah announced an incredible $97 billion in new jobs, welfare payments, and housing support the following week. Government spending trended sharply upwards in the years that followed as Saudi Arabia joined its peer GCC monarchies in expanding public-sector hiring and welfare payments to increasingly unsustainable levels (“Labor Market Reforms” 2013). Yet labor-market policy responses in Saudi Arabia went beyond mere handouts, driven by a perception that (particularly male) citizen unemployment was now a looming threat. “Saudi employment… had the priority back then because of the unrest in neighboring countries, so we had to come up with policies that would employ Saudis as much as possible at that time,” noted one former official. Additionally, these policies would be publicly announced and enforced – signaling to the Saudi population at large that the government would prioritize their employment over the profits of wealthy “captains of industry”. In summer of 2011, Minister of Labor Adel Faqieh announced the new Nitaqat (“Ranges”) program for Saudization, calling workforce nationalization “a pressing national necessity rather than simply a choice” (Al Jabril 2011). The program penalizes firms who fall short of sector-specific quotas that determine the acceptable ratio of citizen to non-citizen employees, denying them access to visas, government services, and public-sector contracts. As thousands of ordinary Saudi citizens began to draw salaries from the private sector, employers bore the costs of adjustment; numerous companies closed rather than meet Saudization requirements, while hiring of expatriates slowed (Peck 2017: 340-343). Despite repeated suggestions by outside experts and the Kingdom’s Chamber of Commerce and Industry that structural factors limited the effectiveness of market-wide Saudization by fiat, the kind of blanket concessions made under King Abdullah have not been forthcoming (REF 2013; Herb 2017). Interviews with a number of Riyadh-based private-sector employers, undertaken several years into implementation, give the impression of a Ministry (now the combined Ministry of Labor and Social Development) with expanded capacity to monitor and enforce quotas and with little “flexibility” in allowing firms to fall short of regulations. Even critical interviewees noted a marked advance in Ministry speed and efficiency over the preceding years, with greater automation and the expansion of e-government services. Specific violations of the program’s terms – such as fraudulent efforts to obtain Saudization “credit” by employing Saudi citizens with disabilities – are met with equally specific threats of administrative retaliation (Al-Misbahi 2017). Overall, despite minor concessions on the pace at which Nitaqat ratchets up Saudization requirements, the government has maintained its all-encompassing focus on Saudization. Firms’ actions demonstrate costly efforts to comply with Saudization quotas, spending significant sums on hiring surplus Saudis regardless of qualifications or investing time and resources into constructing new pipelines of talented candidates. While studying the decision-making processes of autocrats is a challenging endeavor, particularly in the Middle East and North Africa, it is a necessary step if we are to understand how the pathologies of the rentier state might be contained. Consider the dramatic policy changes under Crown Prince Muhammad bin Salman, son of King Abdullah’s successor, who has shown far greater willingness to trade the support of long-standing regime allies in favor of mass appeals. Scores of erstwhile regime allies were imprisoned in the Ritz Carlton Hotel under his watch – with assets seized ultimately helping to pay for a new round of subsidies to citizens in the public sector (Reuters 2018). Rentier theories have long assumed that politicians’ perceptions and expectations of politicians play a key role in connecting the raw realities of government revenue into political outcomes – the mere anticipation of an economic boom may be enough to bring about the various social and political ills associated with rentier wealth (Frynas, Wood, and Hinks 2017). If this is the case, however, it is fair to assume that expectations about the future course of global energy markets contend with (and are frequently subordinated to) more proximate political concerns. ’al-‘aml’: sanatasadiy lil-mansha’at al-mutadhar‘a bil-‘azma al-maliya litasrih al-s’audiyin [Labor: We will resist efforts by firms to use financial crisis as an excuse to lay off Saudis]. (2009: January 19). al-Eqtisadiya. Retrieved from: http://www.aleqt.com/2009/01/19/article_185796.html. Al-Jabril, ‘A. al-‘Aml tutliq birnamij Nitaqat min 3 ‘alwan lil-had min al-s’awada al-wahmiya fi al-qita‘a al-khas [Labor launches three-color Nitaqat program to end phantom Saudization in the private sector. (2011, May 9). al-Eqtisadiya. Retrieved from: http://www.aleqt.com/2011/05/09/article_536140.html. Dr. al-Zaban: al-batala bayn al-s‘audiyin murtaf‘a wifq al-maqayis al-‘alimiya wa hiya wara’ tawarut al-mut‘alamin bijira’im iqtisadiya [Dr. al-Zaban: Unemployment is high among Saudis according to international measures, and is the cause of educated people getting involved in economic crimes] (2007: November 8). al-Riyadh. Retrieved: http://www.alriyadh.com/292334. Embassy Riyadh. (2006, June 7). A Possible Retreat on Saudization? Wikileaks cable: 06RIYADH4543_a. Retrieved from: https://wikileaks.org/plusd/cables/06RIYADH4543_a.html. Embassy Riyadh. (2009: March 24). Saudis Discuss Localizing Manufacturing, Transferring Technology, Wikileaks cable: 06RIYADH4543_a. Retrieved from: https://wikileaks.org/plusd/cables/09DHAHRAN45_a.html. Frynas, G., Wood, G. and Hinks, T. (2017) The resource curse without natural resources: Expectations of resource booms and their impact. African Affairs, 116 (463). pp. 233-260. Hertog, S. (2012). A comparative assessment of labor market nationalization policies in the GCC. In S. Hertog (Ed.) National employment, migration and education in the GCC. Berlin: Gerlach Press. pp. 65-106. Hertog, S. Princes, brokers, and bureaucrats: oil and the state in Saudi Arabia. Ithaca: Cornell University Press, 2010. Liou, Y., & Musgrave, P. (2016). Oil, Autocratic Survival, and the Gendered Resource Curse: When Inefficient Policy Is Politically Expedient. International Studies Quarterly, 60(3), 440-456. Menoret, Pascal. (2016) Repression and Protest in Saudi Arabia. Middle East Brief, 101, Crown Center for Middle East Studies. Okruhlik, Gwenn. “Rentier wealth, unruly law, and the rise of opposition: the political economy of oil states.” Comparative Politics (1999): 295-315. Peck, J. R. (2017) Can hiring quotas work? The effect of the Nitaqat program on the Saudi private sector. American Economic Journal: Economic Policy 9(2), 316-347. Randeree, K. (2012) Workforce Nationalization in the Gulf Cooperation Council States. Occasional Paper 9, Center for International and Regional Studies. Saudi corruption cash settlements will help finance royal handouts: finance minister. (2018, January 24). Reuters. Retrieved from: https://www.reuters.com/article/us-saudi-finance/saudi-corruption-cash-settlements-will-help-finance-royal-handouts-finance-minister-idUSKBN1FD17B. Seccombe, I. J., & Lawless, Richard I. (1986). Foreign worker dependence in the Gulf, and the international oil companies: 1910-50. International Migration Review, 20(3), 548-574. Sharikat s‘audiya tusarah muwadhafiha bisabab al-‘azma al-maliya [Saudi companies let employees go due to financial crisis]. (2008, December 28). al-Alma‘i online forum. Retrieved from: http://www.alalmai.net/vb/t32689.html. Shin, A. J. (2017). Tyrants and migrants: Authoritarian immigration policy. Comparative Political Studies 50(1), 14-40. Smith, Benjamin B. Hard times in the lands of plenty: oil politics in Iran and Indonesia. Cornell University Press, 2007. Shihabi now runs a pro-Saudi government think tank in Washington, D.C. Salman al-Awdah was arrested in 2017, joining a number of other liberal and Islamist reformers in the Kingdom of Saudi Arabia who have been arrested over the past year. Data taken from “Forty Seventh Annual Report,” Saudi Arabian Monetary Agency, 2011, pp. 206. Many Saudi officials are committed to expanding female citizens’ economic participation for reasons of productivity and gender equity. However, male unemployment has more commonly provoked concerns about political instability (Shihabi 2016: 63). Author interview. Former senior employee, Ministry of Economy and Planning, 19 January 2018. ← What would the Saudi economy have to look like to be “post-rentier”?